Canon has announced three new large format printers called imagePROGRAF iPF6300, imagePROGRAF iPF6350 and imagePROGRAF iPF8300. LAKE SUCCESS, N.Y., February 22, 2010 – Canon U.S.A., Inc., a leader in digital imaging and advanced office solutions, today answers the increasing demand for large format prints in the photographic, proofing and graphic arts market with the introduction of three new imagePROGRAF large format models – the 44-inch imagePROGRAF iPF8300, 24-inch imagePROGRAF iPF6350 and the iPF6300. Designed for precise, ultra high-quality print performance and increased productivity, each model features Canon’s new, 12-Color LUCIA EX pigment ink set and advanced printing technologies specifically developed to produce prints with an enhanced color range and improved durability. The new imagePROGRAF models will be unveiled at the Wedding & Portrait Photographer International (WPPI) Convention at the MGM Grand in Las Vegas, March 8-11, 2010. With increasing consumer demand for professional and high-quality print jobs, high-end graphic and photographic studios continue to seek the capability to accurately produce vivid output of consumers’ most demanding projects. To enhance its available color spectrum, the new imagePROGRAF models feature a revolutionary all-new 12-Color LUCIA EX pigment ink set increasing the achievable color gamut by approximately 20 percent from the previous imagePROGRAF iPFx100 series and enabling over 90 percent coverage of PANTONE ® (*) colors to produce rich expression. Additionally, to better meet the needs of the professional print market, the new models feature a reinforced mechanical structure to enable precise ink placement for improved text and line accuracy, making these new devices a powerful proofing solution. The introduction of the new LUCIA EX ink provides photographers with the ability to precisely achieve their desired results by producing more expressive and crisp blacks, smooth color gradations, and the capability to reproduce the finest details in the shadow areas of photographs. The new inks are also designed with an innovative polymer structure that results in greater scratch resistance and protection from color fading, while also reducing bronzing and metamerism ensuring durable, stable output. Recognizing the expanding array of media options for large format printers and to further improve the versatility of these new imagePROGRAF models, Canon has developed a new Media Configuration Tool which allows customers to not only utilize genuine Canon-branded media, but provides the ability to add and make adjustments to paper settings to enhance the precision and quality of output achieved with third-party media. Upon release of the new printer, ICC profiles of popular media types from Intelicoat, Ilford, LexJet and Moab will be available for download on their respective corporate Web sites. 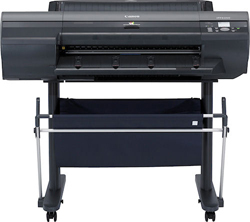 To expand print options and improve proofing capabilities, the iPF8300, iPF6350 and iPF6300 come bundled with a new Print Plug-In for Photoshop®, Digital Photo Professional and support for Adobe Color Management Module, enabling features such as Black Point Compensation. Through the Photoshop Plug-In, each new model allows 16-bit RGB images edited in Photoshop to be sent directly to the imagePROGRAF printers, preserving smooth and high gradation. In order to support high-volume printing and streamline workflows the Canon iPF8300 and iPF6350 come equipped with an 80 GB high-capacity hard disk drive (HDD) that allows for faster spooling of large files as well as the ability to reprint jobs directly from the printer. To ensure the highest level of productivity and reduce overall print time, all new models are also equipped with a standard gigabit Ethernet network interface and an automatic dual-blade cutter. In those environments that utilize a complete workflow solution in conjunction with CGS, EFI, Ergosoft, GMG, ONYX and other leading RIP manufacturers, updated drivers will be available for download upon the release of the printers from their respective Web sites. To fully capitalize on the dynamic color range of the new LUCIA EX ink set, each new imagePROGRAF model employs two advanced one-inch print heads, each featuring 2,560 nozzles per color and outputting a super fine four picoliter (pl) droplet at a full 2400×1200 dots-per-inch resolution (dpi) to reproduce details with extraordinary accuracy and clarity. Paired with enhanced plug-ins and new, High Precision Printing Modes, these new imagePROGRAF models provide an extremely high level of photographic and proofing quality prints. The new imagePROGRAF iPF8300, iPF6350 and iPF6300 are compliant with U.S. ENERGY STAR energy-saving standards and RoHS compliance standards. The new Canon imagePROGRAF iPF8300, iPF6350 and iPF6300 large format printers will be on display at WPPI booth 401 in Las Vegas, NV from March 8-10, 2010. The imagePROGRAF iPF8300/6350/6300 will start shipping in March for a manufacturers suggested retail price of $5,995, $3,995 and $3,695, respectively.